You meet all kinds in Texas. This guy was one of the nicest. Calm, friendly, and his ancestors have been rambling around the state for generations. Though I understand he is not exactly a guy in the strictest sense of the word, but a longhorn steer. Isn’t he pretty? I fell in love with Central Texas last April when we visited the area around Brenham, Washington-on-the-Brazos and, afterward, Austin. April is particularly beautiful for the spectacular wildflowers. I had had no idea this area was turning into a copy of California wine country: vineyards, expensive, yummy little eateries, shops and all! And we hard some of the best music at Luckenbach while eating barbecue and drinking beer at a picnic table. I had mainly come here for research on my novel, Here We Stand, but why not have a little fun at the same time? On this two-month trip to Texas and Louisiana, between Texas barbecue, Cajun fried and New Orleans seafood, I probably gained about eight pounds. Oh well. It’ll come off this summer. I hope. She sees food as fun, you say? You betcha. What’s your favorite fattening fun? 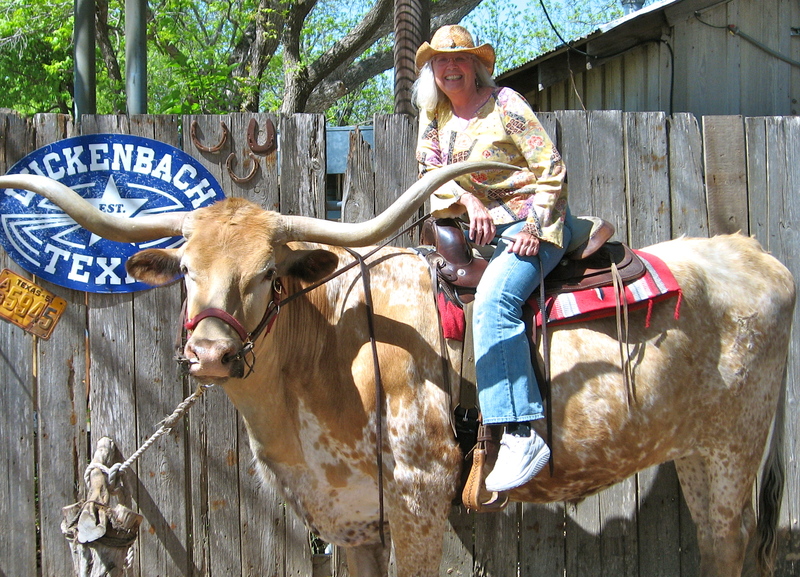 This entry was posted in Food, Musings, Travel and tagged cowgirl, food, longhorn, novel, Texas, vineyards, wine country by Karen Lynne Klink. Bookmark the permalink.